Salads | Life's Conundrum - Eat to Live or Live to Eat? We normally make our bean salads using tinned beans but have now taken a conscious decision to us dried beans moving forward. Although they are more time consuming to prepare we feel happy knowing what we are cooking and think it is probably a healthier option. Pressure cook the butter beans and drain any remaining liquid. Heat a saucepan with butter and olive oil. 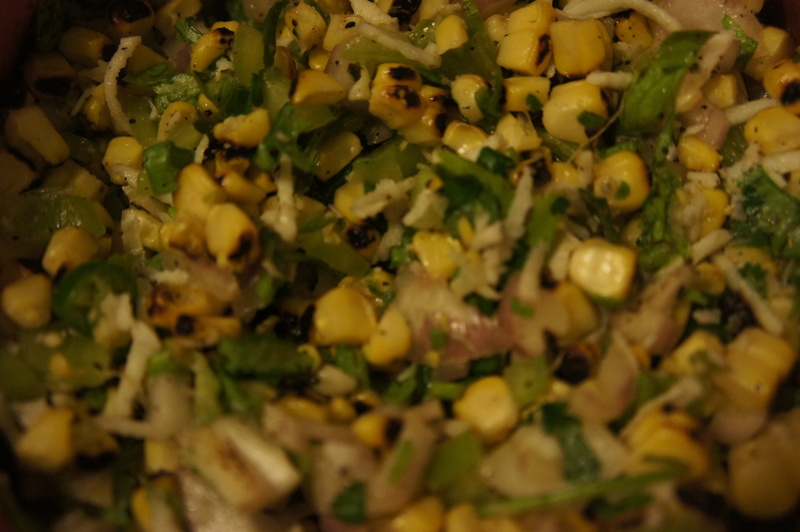 Saute the garlic over medium heat for a minute before adding the onions and green chilli. 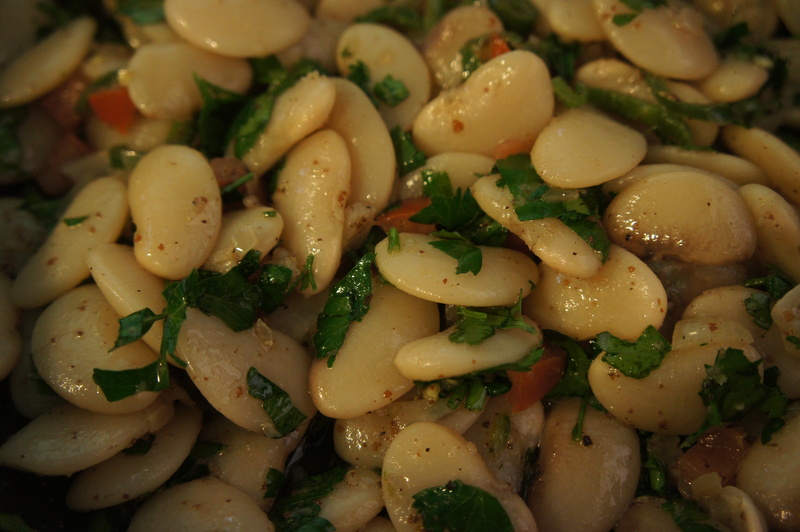 Continue cooking over medium heat till the onions are translucent – add the cooked butter beans, sprinkle the sumac and salt and pepper and switch of the heat. 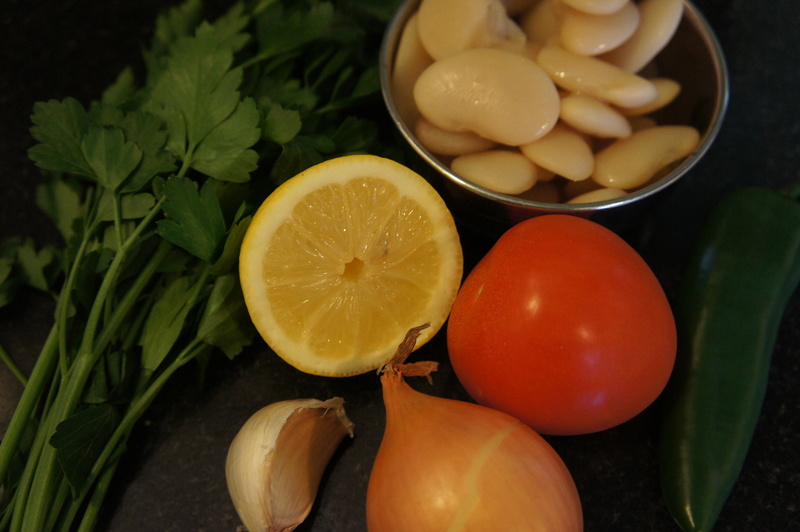 Dress with lemon juice – add chopped tomatoes and fresh parsley and give it a good mix. Serve warm or at room temperature. 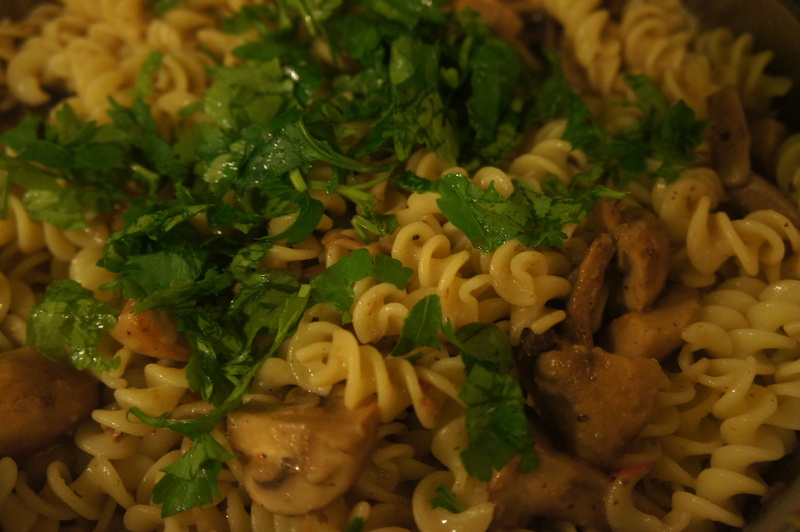 If you love mushrooms and pasta this recipe is for you. We picked up some large closed cup mushrooms last week and decided to make a dry warm pasta dish for dinner a couple of nights back. The dish is incredibly quick to prepare and tastes great. Cook the pasta with some salt and olive oil and keep aside (save some of the cooking liquor for later). Heat a large pan with butter – saute the garlic and red chilli for a minute before adding in the shallots. Cook over medium heat till the shallots turn translucent. Sprinkle a teaspoon of the oregano, give it a good mix and then add the mushrooms. Cook for ten minutes or till mushrooms begin to take on a bit of colour. 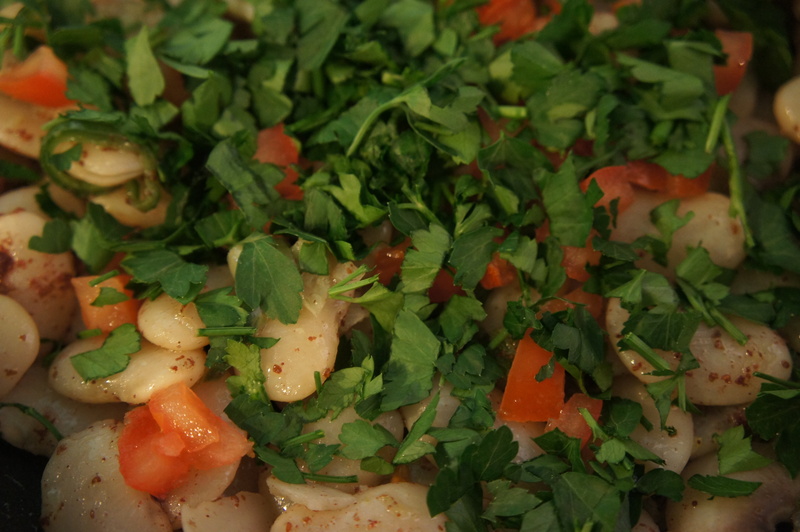 Adjust the seasoning and garnish with fresh chopped parsley. Add the boiled pasta to the dish – if it sticks to the pan use some of the cooking liquor to loosen up the dish. Serve with a sprinkling of grated Parmesan cheese. We have been rather quiet this week but have been collecting a few recipes which we couldn’t find time in the day to post. One of us had a pretty big milestone birthday mid-week – officially in a new age bracket statistically speaking! 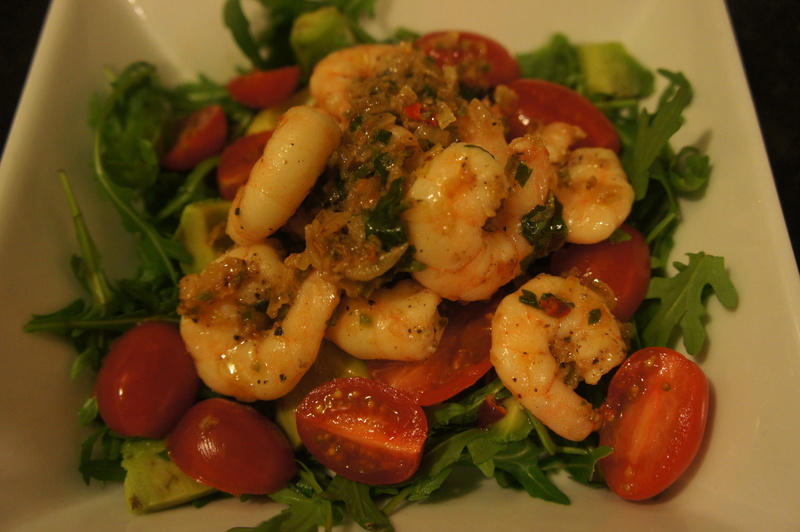 The first recipe we would like to share is a warm pepper prawn salad served with avocado and baby plum tomatoes on a bed of rocket leaves. 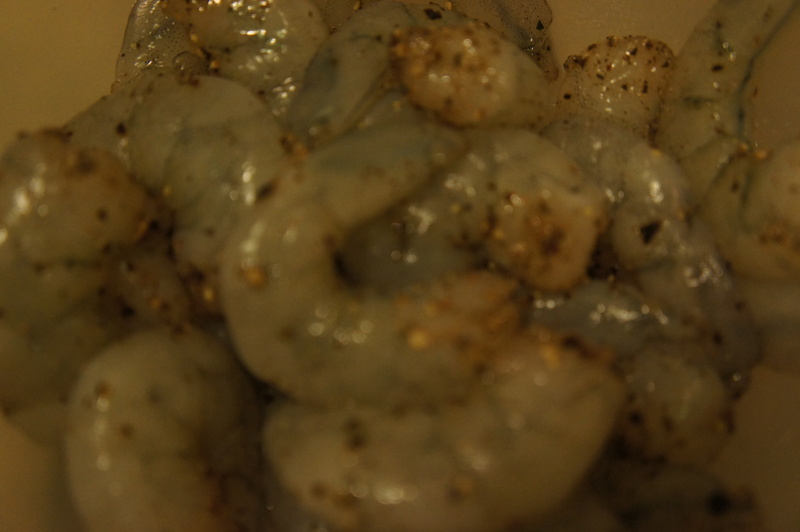 Sprinkle some salt and pepper on the prawns and keep them aside for half an hour. 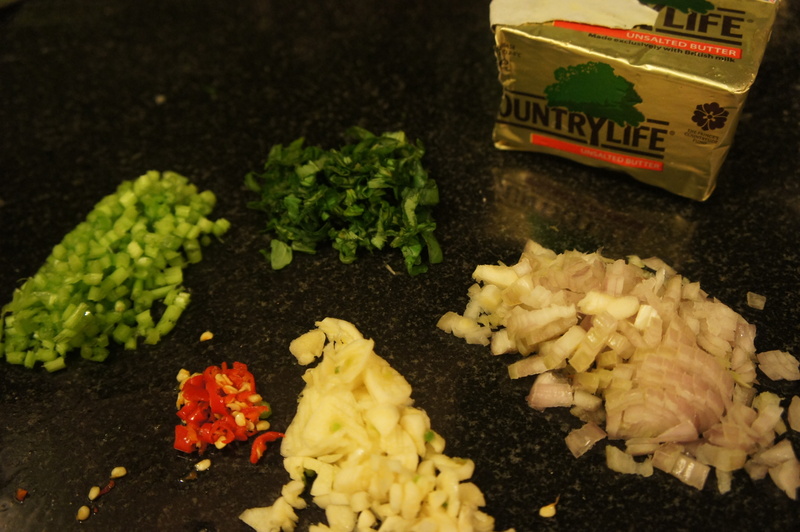 Heat butter in a pan and add the chopped garlic to it – saute for 30 seconds before adding the chopped shallots and red chilli. Continue to saute till the shallots go translucent before adding the prawns. Cook on both sides till done – shouldn’t take more than 8-10 minutes. 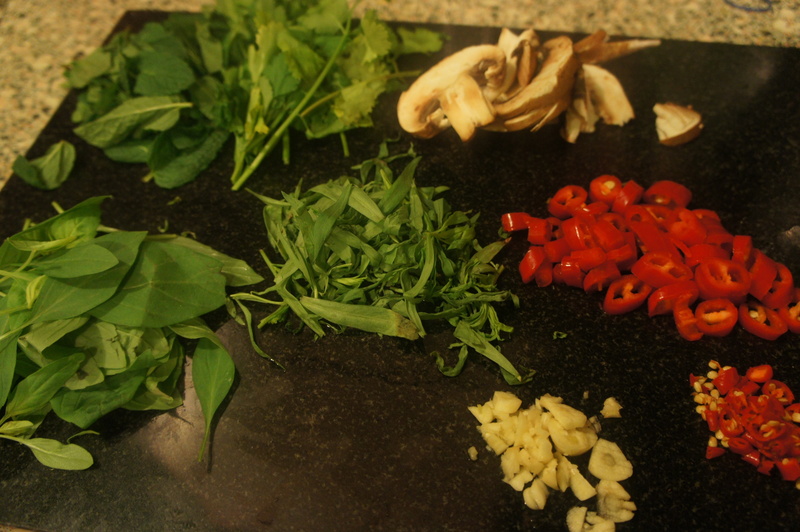 Garnish with chopped coriander stems and basil. Squeeze the juice of half lemon and serve hot on a bed of rocket leaves, avocados and baby plum tomatoes. Red chicory is normally not on our shopping list, although it should be, as it makes an incredibly tasty salad option. Interestingly we weren’t able to find too many recipes on the internet but we came across one by Angela Hartnett which we like and thought we would share it with you. For the dressing, whisk the olive oil and vinegar with some seasoning till it emulsifies. 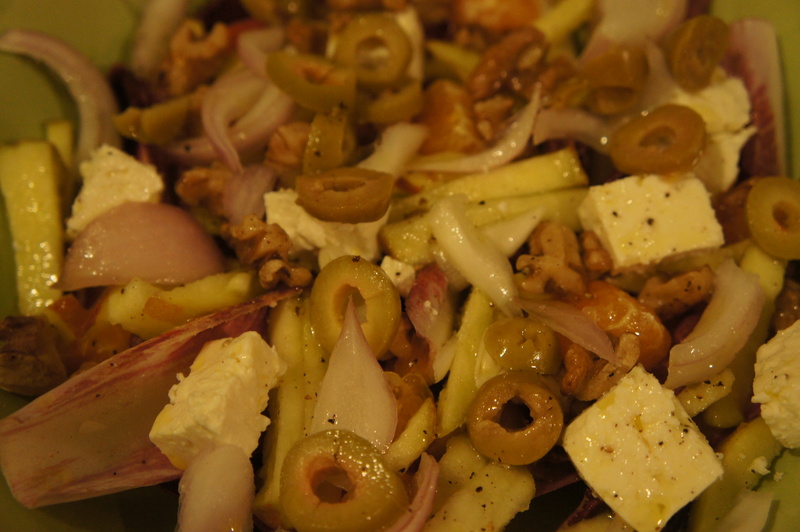 Layer chicory leaves in a salad bowl and add the other ingredients before drizzling a generous portion of the dressing. Enjoy. January is a month when the realization of the excesses of the festive season hits most people and almost everybody wants to detox and diet. Horse gram is one of the pulses which ancient Indian medical sciences of Ayurveda and Siddha claim to have many medicinal properties including liver and kidney detoxification and weight loss (http://en.wikipedia.org/wiki/Horse_gram). Horse gram is also good for coughs and colds. We have some horse gram in our store cupboard and have decided to make a weekly dish to tide us through the winter and try to combat the many winter viruses that afflict us. This is the first dish in the horse gram series with more to follow. Horse gram is a hard pulse and takes very long to cook, so remember to soak the horse gram at least for 8 hours prior to cooking it. Pressure cook the horse gram with a pinch of turmeric powder and two cups of water. Once cooked drain any excess water and set aside. (Do not throw away the cooking liquor as this can be used to make a delicious and healing horse gram soup (recipe to follow)). Heat oil in a wok. Add a pinch of asafoetida and the mustard seeds. Once the mustard seeds crackle add the dried red chillies and the curry leaves. Saute for a couple of minutes before adding the cooked horse gram and salt. 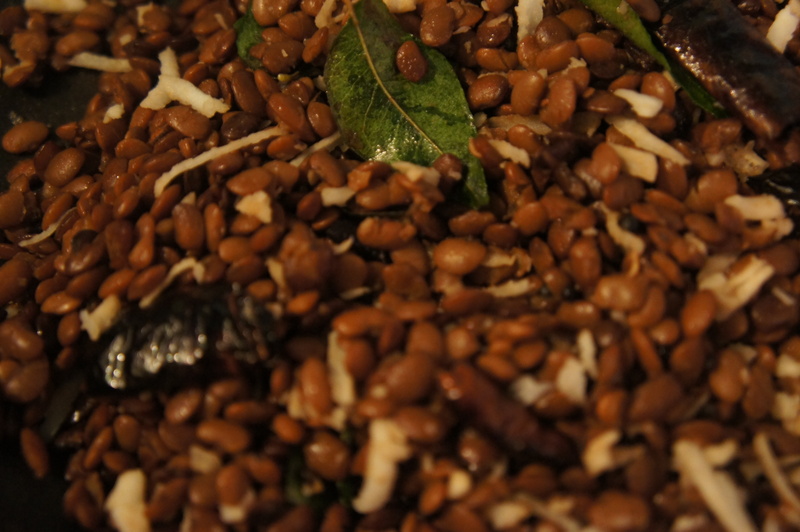 Saute the horse gram for a few minutes, garnish with freshly grated coconut and squeeze the juice of half a lime. Serve warm. A simple salad to pull together as an accompaniment or a summer barbecue staple. Roast the corn cobs over an open flame and then shuck them once cooled. Place all the ingredients in a bowl and mix together. Melt a knob of butter in a large frying pan and saute chopped garlic for 30 seconds. 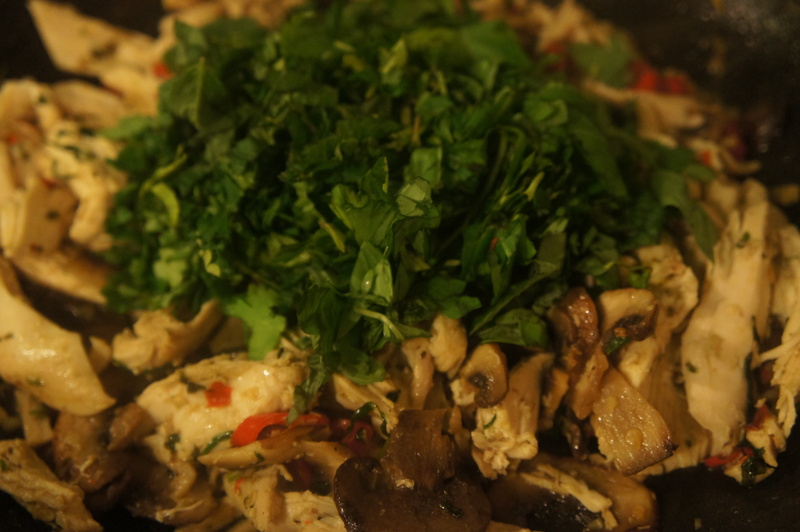 Add the chillies and stir for another minutes before adding the chopped tarragon and sliced mushroom. Saute over medium heat for a few minutes – sprinkle some salt and then add the shredded chicken. Warm the chicken through for five minutes – switch of the heat and add the remaining fresh chopped herbs. 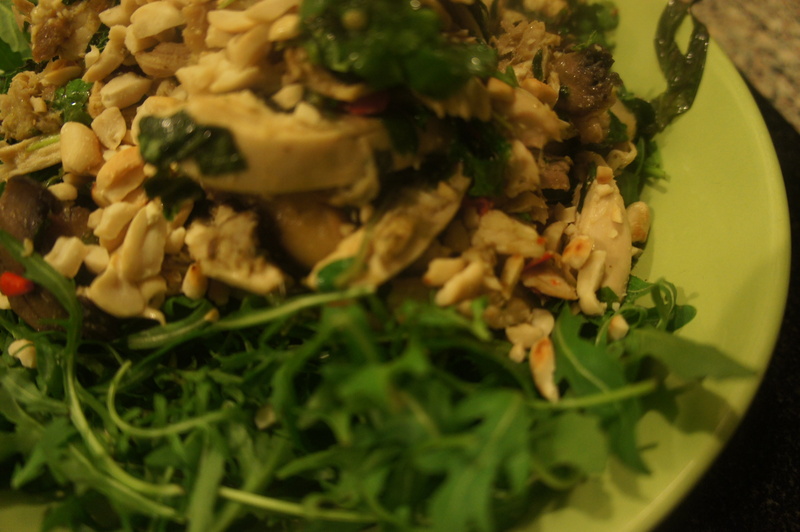 To serve, place a generous portion of the warm chicken on a bed of rocket and garnish with the ground roasted peanuts. Enjoy.